In December 2014 the Russian Federal Space Agency announced that it is considering creating its own orbital station. However, the difficult economic situation might obstruct the implementation of such a challenging project. According to Russian Federal Space Agency Director Oleg Ostapenko, the new space station would help increase the overview of Russian territory and the Arctic by 90 percent and become the foundation for future lunar expeditions. However, experts believe that the station will be built only if Russia declines to extend its participation in the International Space Station project until 2024, as the U.S. is proposing. Earlier it was reported that Russia had been planning to abandon the station after 2020 and redirect its resources to other projects. The final decision about extending Russia's participation in International Space Station (ISS) activity or constructing its own station will be made by May 2015. Experts interviewed by RIR see only a "war of words" between Russia and the U.S. regarding the building of a Russian orbital station. "Talk about the possible construction of a Russian orbital station began circulating after the Americans threatened to stop space cooperation as a result of the sanctions against Russia," said Alexei Arbatov, director of the Center for International Security at the Institute of World Economy and International Relations. Arbatov is convinced that "in the conditions of Russia's current economic crisis the construction of its own orbital station would not be the most efficient way for the country to spend its resources." Russia started discussing the construction of its own space station back in the 1990s. It created the Mir-2 project - its own new-generation station. However, in the end Russia decided to fully concentrate on the ISS project. Today, according to experts, Russia is not interested in the creation or implementation of a new project, but rather with using its existing power systems. Igor Afanasiev, editor of “Novosti Kosmonavtiki Magazine” (Cosmonaut News) believes that Russia's own space station project is actually the continuation of the development of the Russian segment in space. "The new ISS modules are developed in such a way that in case of a disconnection, the Russian part of the station can function autonomously,” Afanasiev said. “Perhaps this is what is meant by creating Russia's own station." "The Energia missile-space corporation, Russia's leading space enterprise, built two new modules for Russia's segment of the ISS, but was not able to send them to the station by the 2010 deadline," explains Pavel Luzin, an expert from the Foreign Policy Agency. "It is very possible that by now the modules have been completed. Therefore, they must be used in some way. And the best way is to use them as a foundation for Russia's own station." Is Russia ready for space reforms? Currently, on Russia's recommendation, countries using the ISS have created a working group that is expected to decide the future of the station and determine when it will cease being used. If Russia decides to construct its own station, then its principal efforts will be dedicated to that project, even if the ISS continues to operate. In that case the ISS's Russian segment can continue being used for commercial objectives. For example, it could be rented to other countries. Luzin explains that today Russia's aerospace activities largely depend on ISS projects. "Half of the resources that the government allots to the federal space program are spent on manned space programs within the ISS framework. That is why the Russian scientific space study program has practically failed”, he says. 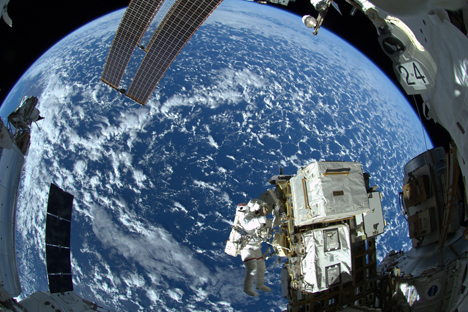 It is important to note that when in 2008 the issue of extending work on the ISS beyond 2015 emerged, Russia expressed its desire to continue the station's activity. Luzin attributes this to the fact that, "Russia was not ready for space reforms, just like it isn’t ready for them now." At the same time, all experts interviewed by RIR said that by 2020, when Russia's obligations before the ISS will end, Russian-American relations will have improved and the countries' cooperation in the field of space will continue.